Good morning! This Finish it Friday was decided upon by the weather. While I really wanted to touch up caulking and paint on the house and paint spindles- it has rained here. Great for the garden and the flowers, but not so great for painting the house. I am glad the temperature is lower though. I was thinking about doing another Christmas or family fun project, when the husband came in with sweet corn for supper. He had 6 ears from just part of the 1st row. I knew what my Finish it Friday would be-Frozen Sweet Corn! I love sweet corn and I love that I can freeze some to enjoy during the cold, snowy winter months. I now have a few easy sweet corn recipes that don’t involve blanching the corn first; this is great because I always worried about the boiling water and the kids. 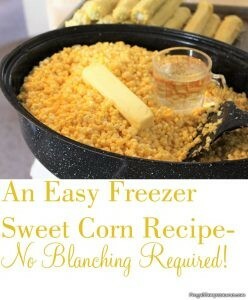 I would make them stay out of the kitchen when I was blanching the corn, much safer-but lonely. 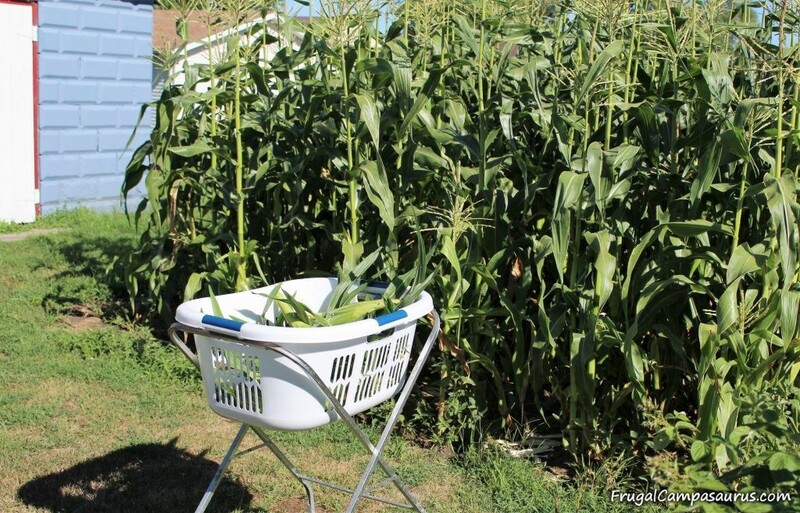 I started picking the corn right away in the morning; unfortunately, I had my sundress and sandals on. This is definitely not corn picking attire! The wet corn leaves and bugs reminded me too much of detassling corn during junior high school. Off for a new outfit! 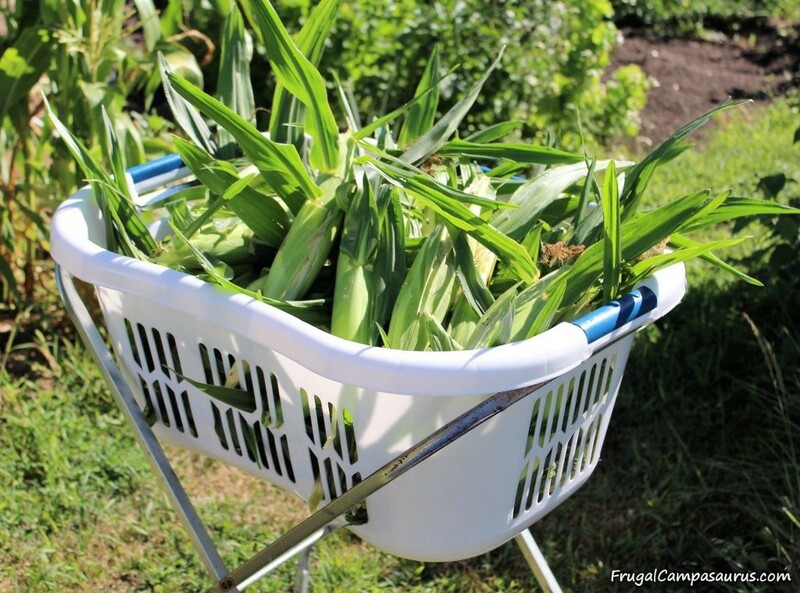 Once jeans, tennis shoes and socks were on, I headed back to my small sweet corn patch. I was surprised how helpful the laundry basket and legs were when picking and cleaning the ears of corn. It was easier on my back to have the corn up off the ground, especially since I ended up with over 4 dozen ears from our 7 short rows of corn! 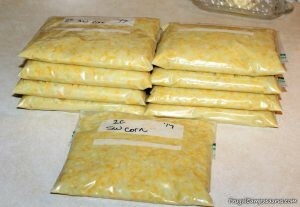 I am also hoping to get 1 or 2 more batches of corn for the freezer before it is finished for the year. 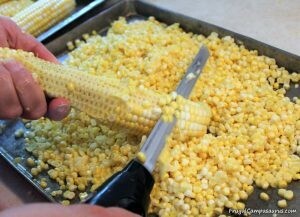 After shucking the corn, I washed it and hoped to remove most of the silk from the ears. Then, I cut the kernels from the ears with an electric knife. For safety, I only cut half of the kernels off and then flip the ear and cut the remaining kernels from the ear of corn. 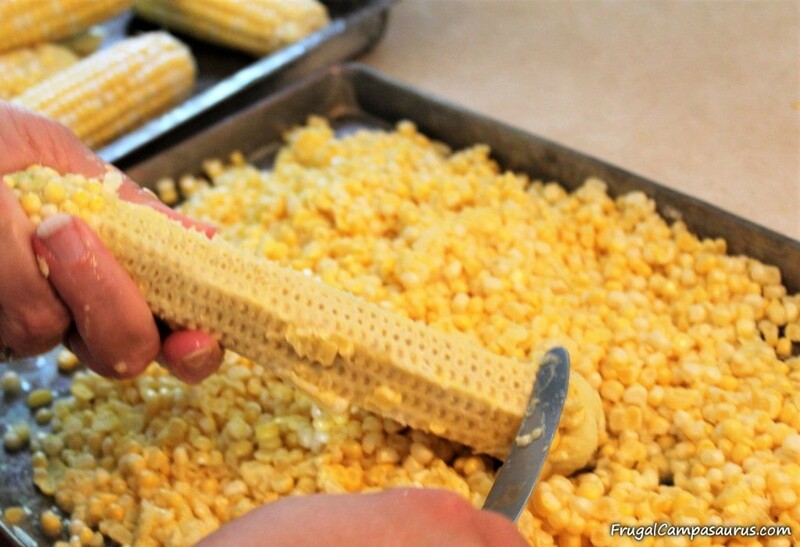 Then I scrape the milk from the ear with a butter knife, I have heard it will make the corn too starchy, but this is how my mother-in-law did her corn. In fact, I learned about canning and freezing from her. I had never seen anyone can tomatoes before and it was fun to hear the jars ping as they sealed. I still love to hear all the pings when I can tomatoes or make jam. 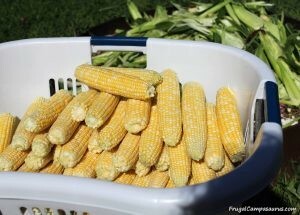 lots of sweet corn earsOver 4 dozen ears to clean, cut and freeze- how fun! cutting cornElectric knife works great! cut cornLarge spatula helps move corn to roaster, I don't even spill it all! 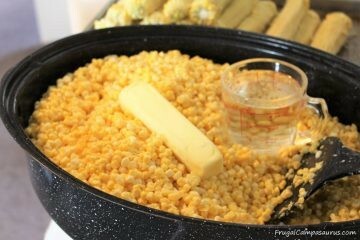 corn in roaster1 stick of butter, 2 cups of water and 4 dozen fresh-cut sweet corn = yummy-ness! caulking by front doorNot as many spots to recaulk- but do they have to be by the front door? Place in large roaster and cover. Bake for 1 hour at 325 degrees. Stir every 15 minutes, scraping down the sides so corn doesn’t scorch. 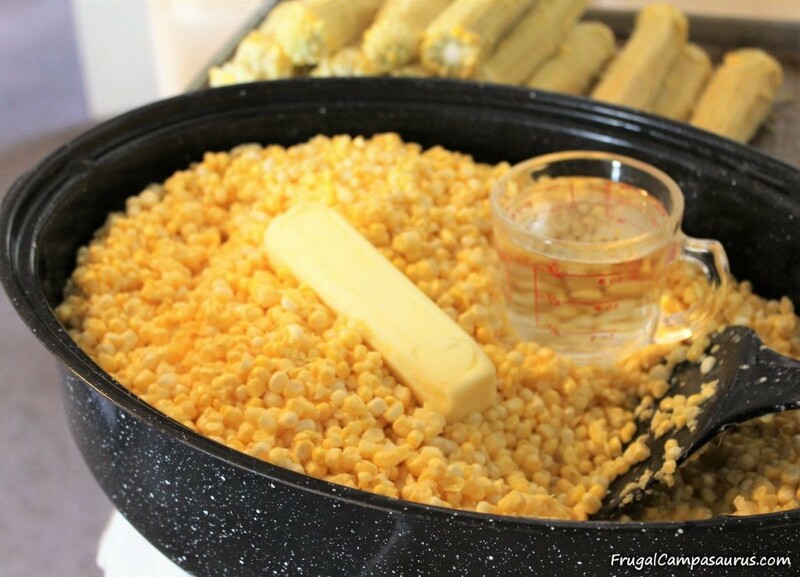 May add more water if needed, there should be liquid on bottom of pan so the corn doesn’t stick. Cool quickly by placing pan in sink of cold water and stirring occasionally. When cool, place into freezer bags, seal, label and freeze. I fold the flattened bags, to remove as much air as possible as I seal them. There were 9 2 cup bags of corn. 9 bags is a good start, though I sure hope to get more sweet corn for the freezer. 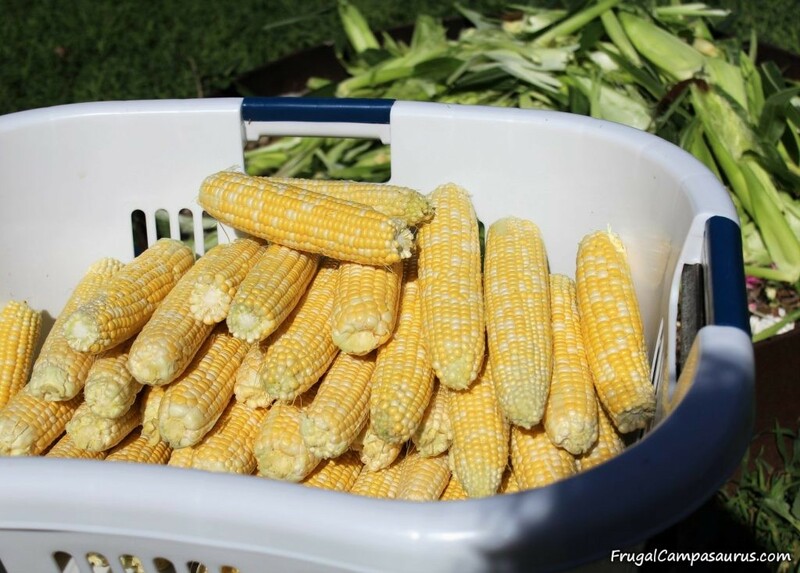 It is great to have frozen corn from our garden, especially for the holidays and cold winter days. I can’t wait to can tomatoes, pizza sauce and spaghetti sauce soon. I am also starting to get cucumbers, so I will freeze my mother-in-law’s vinegar pickles too. This Finish it Friday was not what I intended, but it was yummy and I am glad to have it done. I did get the recaulking done, even if the painting will need to wait for a dryer day. Hope you enjoy the weather, even if it is raining, and any projects you might find to finish! Happy Camping ( or sampling yummy sweet corn)! Next Post:4 Fun Camping Ways to Use Noodles-Pool Noodles, That is!